The cigar box guitar is a simple instrument so the electrics consist of a simple piezo pickup, a volume potentiometer and a 1/4″ jack socket. Glue the Piezo to the underside of the lid behind the bridge position. Solder the red wire to the left hand lug on the potentiometer (pot). Solder the black wire to the metal top of the pot. Bend the right hand of the 3 lugs back against the metal pot casing and solder it to the casing. Connect the middle lug with red wire to the live lug on the jack socket and solder in place. 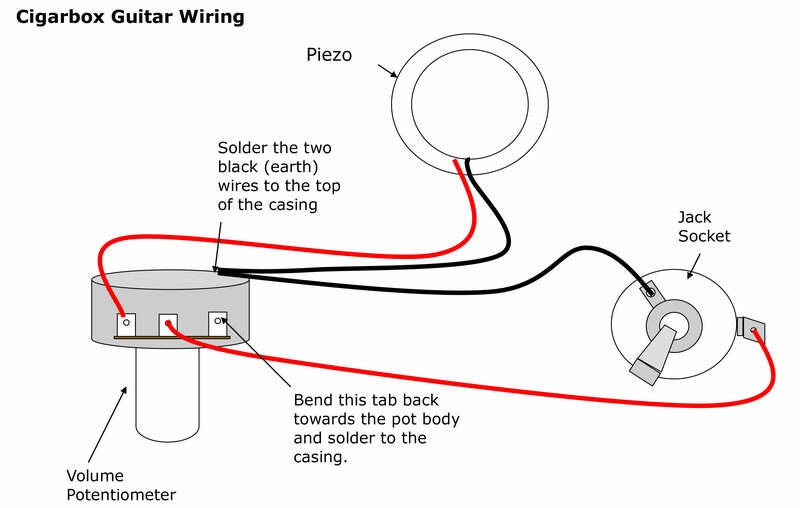 Solder a black wire to join the metal casing of the pot to the earth lug on the jack socket.